I might be a bit thick but sometimes I just don’t get it. I hear the news, I watch the news, I report and talk about the news but I am frequently left shaking my head at it. The cabbies of Castor, the hairdressers of Herlington and the gardeners of Gunthorpe must have been equally mystified by Spreadsheet Phil’s budget last week. Alongside the usual rise in the price of beer, some rubbish jokes and the Prime Minister’s amazing laughing shoulders, there was a huge shock for the grafters; those with an idea and the bottle to develop it. We are on the cusp of pressing the exit button from the EU, the Scots are restless again over the border (those that are still standing after the mauling at Twickenham) and our economy is in a fragile state, with nobody certain of the consequences that follow our Brexit action. Yet Chancellor Philip Hammond decided that this was the perfect time to raise National Insurance contributions for the self-employed; in effect, playing poker with the very engine room of our economy. Phil claimed that it was only fair that the self-employed should pay in a similar amount as an employed person. Although he failed to mention that the self-employed don’t get holiday pay, sick pay, health care or a work place pension and if the phone doesn’t ring, or the shop door fails to open, nobody deposits a pay cheque in your bank account at the end of the month. One Peterborough business owner I spoke to described it as a kick in the proverbials, especially after his business rates had just been revised upwards, whilst the likes of Amazon had seen theirs go the other way. Worried and uncertainty reigned supreme but it was all for nothing. Just a week after Mr H had announced his policy and broken his party’s 2015 election manifesto pledge, he pulled on the handbrake and performed one of the biggest political U-turns ever seen in Westminister. I again just shook my head, surely this is not how we should be running a country, on the bag of a fag packet, with goalposts moved, seemingly on a whim, leaving businesses to guess at what might be coming next. Maybe it was the backlash from his own MP’s, maybe it was a guilty conscience or maybe he just realised that in order to survive outside of the EU we will need entrepreneurs to emerge, to take a chance and create wealth. We have nearly five million self-employed people in this country today, making up just 15 per cent of the workforce. Yet they are responsible for almost half of all employment growth since the financial crash. It is they that have been driving our economy forward and ensuring it out performs all others in the Europe over the last seven or eight years and surely that needs to be nurtured and encouraged, not penalised. You must be brave to go self-employed and be prepared to do 15 different jobs at the same time, whilst coping with the stress and the rigours of 16 hour days. It is not worth working out your hourly rate, it will be much lower than the living wage, as you struggle to get the business off the ground. I am all for closing tax loopholes but isn’t it big business that needs to pay more tax rather than the little guy starting out on the precarious path to success? 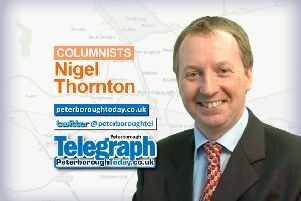 In our new, post Brexit, economy, don’t we need more risk takers in Peterborough, not less, prepared to be self-reliant and bold and use their resourcefulness to skill up and create? I just hope we deal with Brexit in a more considered and sophisticated way and that the plan isn’t being put together with the help of 20 Marlboro Lights and a William Hill biro.